All Things Slobbery : Bo's Room - it's coming together! 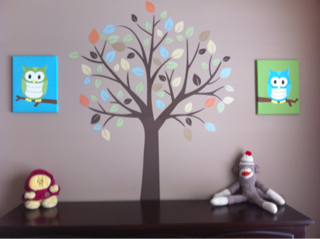 The tree is a wall decal - it was really easy to put up! 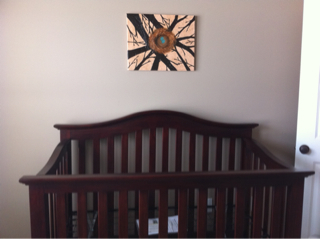 Crib and the beautiful painting my sister Becky painted for me. 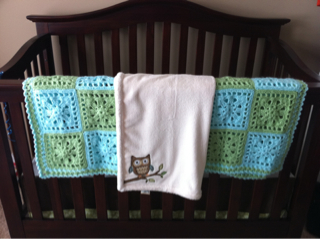 Beautiful afghan that Twyla Kitchen made for Bo and the cutest owl blanket from Mrs. Davis, Becky Davis, and Katie Manthe. 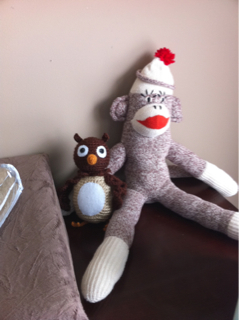 Sock monkey has a new friend! Elizabeth Hill made the adorable owl. I love it! Looks great!!! I love the decal and all the owls. So so cute. =) I hope you're feeling well!! !